Precleaned slides are ready for use—no preliminary cleaning necessary. Slides feature ground edges and a superior surface finish. 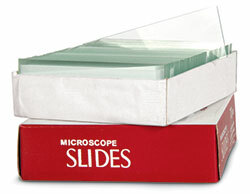 Lint-free dispensing pack is designed for easy removal of single slides without touching the flat surface. Each pack contains 72 slides. Items sold by USABlueBook are intended for use only by professionals in the water and wastewater treatment industry. Many items sold by USABlueBook require supplemental training, licenses or permits for proper use and may be harmful if not used properly. All content © copyright by HD Supply Facilities Maintenance Ltd., d/b/a/ USABlueBook.